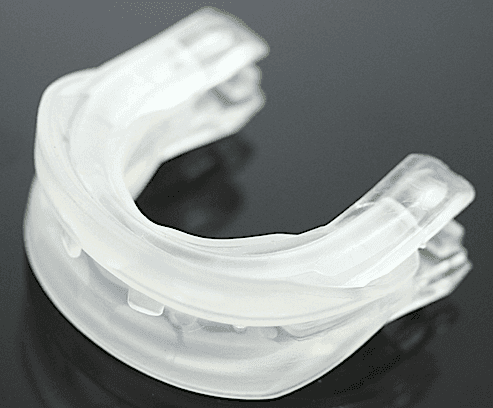 Both the Stop Snoring Today chinstrap and the PureSleep MADs (mandibular advancement device) are effective treatments against snoring. My wife and I decided to go with the PureSleep since it was much more comfortable and effective than the Stop Snoring Today. You have to be careful with the fitting process, as detailed in the instructions, before you attempt to use either product. The Stop Snoring Today supports specific muscles and tissues in your throat, which opens your jaw and allows you to keep your airway clear while you are sleeping. 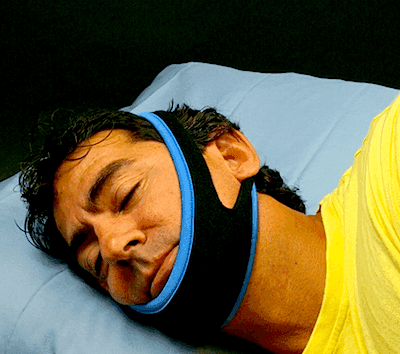 This device helps to eliminate the snoring sound but many users have complained about the lack of user customization and frequent soreness due to the tight strap. After ordering two Stop Snoring Today chin straps online, my wife and I waited over two weeks for the package to arrive from Israel. As soon as I opened the box, I knew that we were going to have difficulty fitting the straps due to the one-size fits all design. We have different head sizes so mine ended up being too tight and hers kept coming off every few hours. The next morning, we felt exhausted and the strap left a lasting soreness on both of our heads. Our teenage son said that we had kept him up all night due to our snoring. I tried readjusting the chinstrap the next two nights but it only ended up increasing the soreness and only partially reducing the snoring. My wife and I liked the fact that all you had to do to clean it was throw it in the washing machine. However, since it is a tight strap, we felt an obligation to clean it frequently since it kept getting sweaty. PureSleep arrives in two parts: one piece is designed to fit the upper jaw and the other to the lower. Once you figure out the most comfortable fit, you use the boil and bite fitting method. This means, however, that you must take extra care during the fitting process, as you cannot later adjust it after you have completed the fitting. This device has a number of small crevices, so you must be very careful when cleaning. Ordering and shipping took significantly longer than it did for the other anti-snoring devices I have used. Initially, it took out some time to fill out the 21-question form. I did not mind this very much as I wanted to verify that I was a good fit for the product. The two-week shipping time, however, made both my wife and I somewhat annoyed. I knew about the boil and bite fitting process so we took our time making sure we had the correct initial adjustments. Some other devices are a little more forgiving of mistakes. With many other products, if it does not fit right, I always had the option to adjust it the next day. This is not possible with the PureSleep. The first night went well for me. I woke up refreshed and my mouth did not feel too sore. My wife, however, had some pain in her mouth and I think it was because she could not get the right initial fit. However, after three or four days, she no longer experienced soreness and slept without any problems. My son told us, after the first night, that he did not hear any snoring sounds coming from our room when we wore the PureSleep. My wife and I did not enjoy dealing with the complicated cleaning process. It took a lot longer than with most other devices due to the customized design and elaborate openings. The biggest drawbacks of the PureSleep include the fitting process and the elaborate cleaning. My wife would have been a lot happier those first few nights if she had been able to adjust the PureSleep to her exact specifications. With the Stop Snoring Today, you will pay more money for a product that is, at least for my wife and me, ineffective and, at times, painful. If you decide to purchase make sure to visit my PureSleep coupon page.